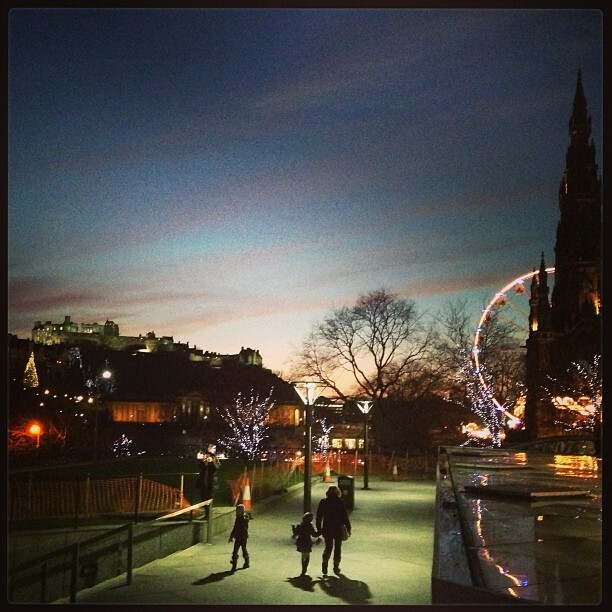 The photograph is of Edinburgh, taken one December night by my son, Andy. My story today for Story a Day for a Week in May, features a character from one of my Works in Progress, a novel, the first in a series of three. Mirabelle was only passing: only intended buying a couple of things for her afternoon tea: a cream éclair and a pint of milk. Usually, she preferred shopping late at night when the supermarket was sleepy, almost silent. Then, she could take her time, the aisles to herself, no one to watch her haphazard wander from item to item as she randomly remembered what she needed: bread, toilet rolls, milk, oranges, washing-up liquid, cheese, apples; back and forth from end to end of the shop. If anyone were to ask her, she’d tell them, ‘Only exercise I get!’ she’d say. But it wasn’t true. She walked everywhere, occasionally jumping on a bus if going further afield than Edinburgh’s serried city centre, but mostly huffing and puffing up its hills and along its streets, watching people, searching faces. Mirabelle loved living in Edinburgh: loved the atmosphere created by a city whose main shopping street looked across the road to a castle. The Castle standing guard over Princes Street, its severe façade softened by the gardens that skirted it. The gardens themselves cocooned from the bustle and noise, folded into their own tree-lined valley, the paths dipping into and out of its depths. Almost daily, Mirabelle lingered on one or other of the benches tucked neatly against the edges of long stretches of grass, sometimes with tears coursing down her face as regrets stung her consciousness. Her need to turn back time was a fierce, swirling whirlpool that could never be satisfied. It dragged her down to the depths of her despair where pain would break over her in shuddering waves that paid no heed to where she was and who was watching. She never tired of the secrets hidden in the Royal Mile, its cobbles leading from the Castle Esplanade to Holyrood House. Should she walk its length every day of her life, she reckoned she’d uncover something she’d missed before: wynds, alleyways that snaked behind old buildings; ancient doors leading who knew where; tiny stairways spindling up into special places. Tourist shops and museums served those without time or inclination to wander from the street, tiny theatres and history rewarded those who did. From Lawnmarket to Cannongate, the Royal Mile buzzed with visitors, students and lovers. She barely noticed the tourists; studied the students and lovers. As she searched their faces, looking for that one special one, they’d sometimes turn, a smile warm in their eyes, happy to share their glow with someone they must have imagined a tourist herself; her colouring declaring her part Jamaican, her loose, colourful clothing more suited to the Caribbean than Edinburgh’s austere Calvinism. Up the Bridges and down the Cowgate, Mirabelle showed her photograph, asked her questions and raked through second-hand shops for her scarves and shawls, bags and boots, sandals and skirts. 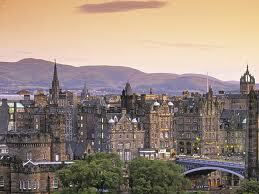 She knew the adage—that Edinburgh was ‘all fur coat and no knickers’. She was well acquainted with its underbelly, its darker side; saw its dirty linen but loved the city of her birth anyway. She walked its streets with pleasure. But her reason for perambulation was pain. Always looking but never finding who she truly sought. Today, her wanderings had taken her down to the Stockbridge area, in and out of charity shops and bookstores, dodging heavy showers of rain, and now she was nearly home. She was laden with wonderful treasures and interesting volumes: an oriental fan, its Geisha smiling shyly out at her when opened; another bag to join her collection, this one beaded and embroidered in swirls of purple and lilac, its handles long and soft, comfortable on her shoulder. She’d found a biography of PG Wodehouse, in good condition but obviously read and enjoyed, its pages well thumbed, its spine like a well-oiled joint. And her prize: an ancient volume of Shakespeare’s Sonnets, its brown leather binding caressed and worn, speaking as eloquently of love as its contents. One last stop at the supermarket down the road from her flat. She needed a pint of milk and was partial to a fresh cream éclair. Her taste buds tingled in anticipation. She was heading through the car-park when her steps faltered, her mouth dried. Without thought or care, she dumbly shadowed a young woman who walked from her car carrying a couple of clinking bags. Halting, unable to move away, she watched as the woman threw bottles in the recycling bin, Mirabelle flinching with each crash as they smashed on top of the pile. The uniform jeans and tee-shirt gave nothing away and she couldn’t see her face properly, but the woman looked the right age: eighteen or thereabout. Mirabelle took from the depths of her bag the small, pocket-sized photograph album and studied the picture again, though she hardly needed to, she knew it so well. The photograph was old and crumpled but the features were clear. With little imagination, it was possible to age the sweet young face looking back at her by two or three years. She replaced it in her bag and continued her observation. The girl’s hair was almost the right colour, the colour Summer’s hair could be now, assuming it had darkened and dulled with the months and the lack of care and nutrition Mirabelle assumed her to be suffering. Reddish-light-brown, but that didn’t count. Hair colour was unreliable for identification: it could be changed on a whim. And the loose curls falling round her shoulders, they could be manufactured too. Height about right: father tall, mother average. At an estimate, the young woman she had followed in the supermarket car park was slightly above average, about five-six or seven. Mirabelle sighed. She’d need to see her face properly, study it up close. It was not enough to approach her just because she had a hunch. ‘Tommy’ placed his bulk between Mirabelle and his partner. “Why? H’ve ye lost someone?” The woman looked around. With a sigh of relief, Mirabelle picked up her purchases and retreated from the car park, watching as the couple gathered their kids and headed for the shop. She shuddered, realising the woman was far older, probably mid-twenties. Mirabelle was suddenly aware she could be losing her touch, losing the subtle skills she usually employed. She’d have to tighten up. Be more careful. It wasn’t difficult to get used to losing things. Some things seem so trivial, as though they’re meant to get lost and not be missed when they’re gone. Like the paper slip that flutters from a box of chocolates, its information repeated inside the lid or on the bottom of the box. She was used to losing her door keys. It used to be a frustration: the hour lost every day hunting them down in the chaos around her. She’d found a way of coping with that: she stopped locking her flat door, leaving it open in case Summer had lost her key, leaving the stair door on the latch too when she went out, buzzing a neighbour to open up if it was closed on her return. She learned to cope with other losses: people, places, names, what you went through to the other room for, what you meant to get at the shops. She even learned to cope with bigger losses: when her father died, her baby sister, her brother, her mother. She missed them. She found the passing of years had softened the loss. Or maybe it was just she had learned to live with the pain. But, after almost three years, she hadn’t learned to live with the pain of losing Summer. And no amount of milk or fresh cream éclairs could soften it. She didn’t bother entering the shop. It’s time for story No.6 in my Story a Day for a Week in May stint. Yesterday, my story introduced you to Jayne, the main protagonist in ‘Flying Free’, the novel I am preparing for publication next…when I’m not getting sidetracked by writing short stories, writing my blog, networking and doing all the necessary things to build a platform to launch it from. Today, I thought I’d take you back to another of my WIP, working title ‘Have You Seen My Daughter?’, and another character who has a part to play in it. You already met Mirabelle a couple of days ago when she bought her pint of milk..or, rather didn’t! Remember? Mirabelle set out to buy milk and a fresh cream eclair, got sidetracked and went home without them. Kay consulted her Edinburgh A-Z. Yes, this was the street, Broughton Street, not somewhere she’d been before, though she’d often enough been in the area. With the John Lewis store only a few hundred yards away and the Playhouse Theatre not much more, she’d probably parked here sometime without noting the name on the corner. She walked down, counting out the numbers on the grey stone tenement buildings till she found the one she needed. Yes, this was it. Her heart started racing. She tried to remember what she’d learned from a book she’d bought a few weeks ago. Aware she was on the verge of another breakdown, knowing she needed help but reluctant to go to the doctor again, she sought out the book she’d heard of on the radio: ‘Emotional Freedom Technique’. It taught her the calming benefits of tapping on acupressure points in conjunction with affirmative statements. It seemed to help. “Excuse me!” The man stood back, his key in hand, waiting to enter the stair. “Did you want in the stair?” He held the door open for her. “Suit yourself!” And he was gone, the heavy door swinging shut behind him. Mentally kicking herself, she leant against the wall to ‘take a minute’ to let the pounding stop. Even in her distress, she could imagine how stupid she looked. Standing there like an idiot, tapping all over the place. The self-help book didn’t mention how to cope with public humiliation when in the throes of the routine. If it wasn’t that the damn therapy seemed to help, nothing could’ve induced her to make such a spectacle of herself. There was a shop not far from the entrance to the flats. She dodged inside to collect her thoughts. It was a butcher shop. Kay was vegetarian. Bile rose to her throat at the smell of raw meat and she turned to leave, but her escape was cut off by someone else’s entrance into the shop, necessitating she move forward. Side-stepping, she came against a cool cabinet. Milk! She’d buy a pint of milk: buy escape, buy time. There were rows of cartons with writing of various colours in the refrigerated cabinet. After straightening each row, Kay selected the green-labelled, semi-skimmed milk, not because it’s what she wanted, but there was an extra carton in that row causing a lop-sided display. When her purchase was complete and she left the shop and approached the door to the stair again. ‘I can do this! I can do this!’ Taking a deep breath, she scanned the intercom panel. Milligan, third floor, Flat no 3F2. Kay’s gloved hand shook as she reached for the buzzer: her whole body shook. Perhaps she was going to faint again. She took another deep breath and tightened her grey, belted coat closer round her thin frame. No, it was just the exertion of walking from the Centre car park and then trying to execute an intensely private routine in an eminently public setting. Idiot! That, and the abattoir scent of the butcher shop making her stomach churn, and the trembling that overtook her whenever she thought of the predicament she was in. She could see herself: a shivering, shaking, frightened mouse, clutching a carton of milk to her chest. Everything about her was mousey: hair, clothes, pointy face, the ability to make herself disappear into the woodwork: the only drop of colour, the writing on the milk carton. When did the trap spring on her? How long had she trembled in its grip? Willing herself to be calm, she tucked her neatly bobbed, mousey-brown hair behind her ear and buzzed. Detective Inspector Burns had told her she’d need to keep buzzing up. ‘Mirabelle never answers first time,’ he’d said. Mirabelle. Mirabelle Milligan. Quaint name. Kay smiled, imagining a sweet, old Miss Marple-type lady: twin-set and pearls, tweed skirt and brogues: running a Missing Person Bureau as a hobby. Probably didn’t answer at first because she couldn’t hear the buzzer. Kay kept her finger on longer this time. “Step away from the buzzer!” the disconnected voice boomed through the intercom. There was an angry buzz as the dark green, heavy wooden door was unlocked for her. Yesterday’s gourmet delights had left their stale odours hanging in the still atmosphere of the stair and Kay wrinkled her nose in distaste. Curry had never been a favourite of hers. At least the stair was clean, brightly painted and well-lit; though Kay declined the offer of support from the well-worn wooden banister, and climbed the stairs drawing her coat close to ensure it didn’t brush the walls. ‘Even though…’ she mentally tapped all the acupressure points. Did it count if you only imagined the tap? It was not Kay’s way to walk into someone’s home without being properly escorted, but she expected it to be office premises, so that moved the rules a little, and she found she could overlook the informality. Checking her low-heeled, mid-brown court shoes were clean, she stepped across the threshold. But it wasn’t an office. The hallway was cheerfully decorated with every door a different colour and bright poppy wallpaper on the walls, the kind Kay might have expected in Miss Marple’s kitchen, and there were pictures on every wall. Pictures of children and families, all white teeth and happy hugs. Grandchildren, she guessed. Miss Marple’s children and grandchildren? But so many? Then it dawned on her: these would be families reunited. Families Miss Marple—she must stop calling her that—families Mirabelle Milligan had reunited. She tried to guess who had gone missing in this one? The teenager possibly? She looked suitably shame-faced. And this one? The old lady? And who would Mirabelle Milligan be? The same cheerful, round face appeared in some, in fact, in most, of the groups: a large, smiling, olive-brown face with deep, avocado-green eyes and unkempt, curly brown hair. Kay realised she was addressing the owner of the round, brown face with the bright, twinkling eyes; a colourful, commanding woman, against whom Kay felt very small, though she had the advantage of height. She doubted she’d ever be the mouse who roared at this lioness. Mirabelle held out a plump, dimpled hand, be-ringed on every demanding finger. “Thank you,” she said with a nod towards her post. “Oh! Yes! The letters!” Kay handed them over. Mirabelle smiled briefly and wandered into what looked like an office of sorts. There was a desk. Buried beneath piles of papers and empty coffee mugs, somewhere, the outline of a desk or a table was apparent. And there were at least two chairs, though it was hard to be sure because there were so many boxes and bundles of this and that and toilet rolls. Heaps of toilet rolls. Kay stared at the various pastel packets. “Oh! I thought…” Kay was thrown by the unexpectedness of Mirabelle’s voice. Rather than the gentle, kindly, Miss Marple purr, here was a broad, strong, Edinburgh accent temporarily overlaid with a playful hint of the West Indies. She held out the carton of milk. Mirabelle took it without raising an eyebrow at the unexpected gift.